Romantic porcelain pink tulle float over an ivory lining to create a rich and dreamy feel. The dress was never worn and has been stored in garment bag since my wedding. 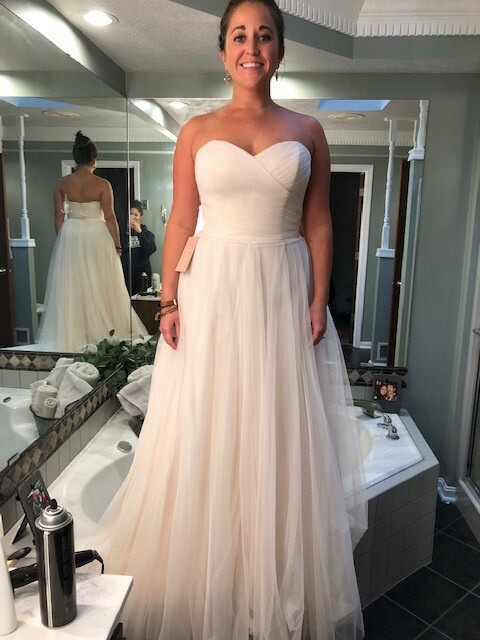 I bought the dress as a second look for my reception but never changed into the dress and could not return to designer. I included the photo of me trying the gown on at home as well as on the model listed on the website. I also took a few pictures of it on the hanger from my living room above the fireplace to show current state of dress. The dress could use a steam from hanging in the garment bag but overall the condition is new!